Simply Katricia | What are the Benefits of Essential Oils? Diffusers are a way to get oils into the air so aromatherapy benefits can be enjoyed. Many positive effects are received for the body, mind and mood by inhaling the essential oils that are in the air. My favorite oil to to inhale all year long is peppermint. When purchasing sets of oil, the first label I look for is peppermint. Properties of peppermint oil assists with calming the mind, pain relief, and respiratory relief. If you’ve ever engaged in conversation with me, you’d know that I enjoy the smell of peppermint so much that I chew peppermint gum, keep starlights in my pocketbook and desk (reminder that I need to refill my bowl), and use a Vick’s Nasal Inhaler during the day and at night to relax my mind. 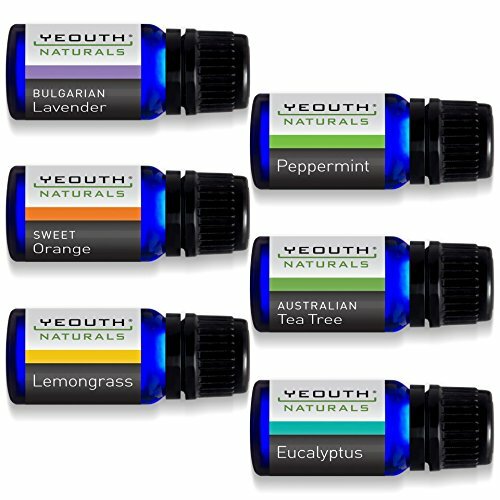 Using Yeouth before, I saw that there were oils used for diffusers available. Here is a preview of the benefits of each of the 6 oils in the starter therapy pack. It may help prevent or kill head lice. It may help curb skin inflammation. It has a calming effect and divine fragrance. May help kill a number of germs responsible for colds, flu and other illness. Tea tree oil has been shown to kill or repel insects. May help control underarm odor related to perspiration. Applying a mixture of tea tree oil and coconut oil can help prevent minor cuts from becoming infected. Relaxes muscular and nervous spasms. Alleviates anxiety, anger, depression, and certain bodily inflammations. Very good for maintaining healthy, smooth, and glamorous skin. It also helps cure acne. Apply topically for Pain Relief. Drink up for irritable Bowel Syndrome. Breathe deep for Respiratory Relief. Use orally to prevent Bad Breath. Helps relieve pain in muscles and joints, as well as toothaches and headaches. Detoxify the body and stimulate the production of milk. Effective for treating a number of respiratory tract infections including cold, cough, running nose, sore throat, and nasal congestion. Helps prevent conditions like dandruff, itchy scalp, and psoriasis. Can also be effective in treating stress and mental disorders as inhaling its vapor help increase blood circulation to the brain. If you use any of these essential oils on your skin, mix a few drops to a carrier oil like coconut or olive oil. If you use to digest, make sure to dilute with water.